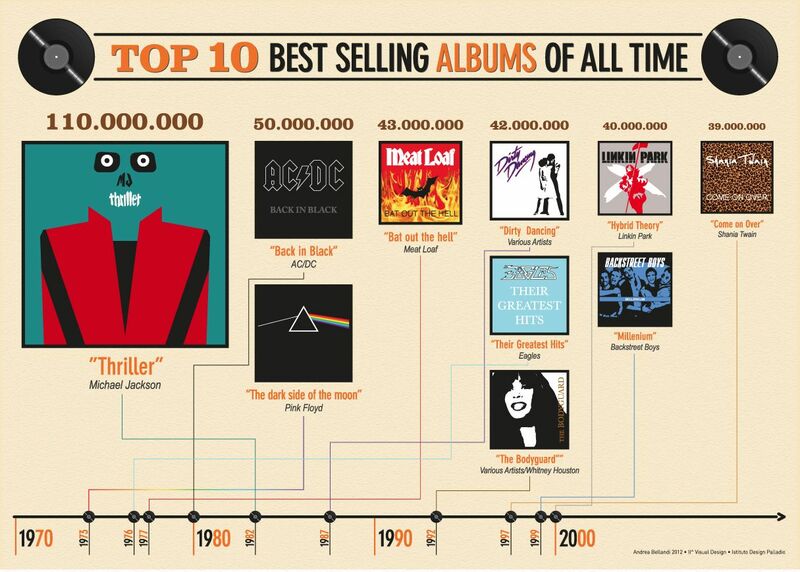 There have been billions of recorded albums since the first recordings in the early 20th century. Recorded albums were done as books that came with different “78rpm record”. In 1948 the first vinyl LP (or long playing) records came out and they played 33 1/3 rpm. These went on to different media such as CD’s, MP3/MP4 and these days are mostly downloaded onto USB Flash drives or mobile devices. Sold 43.7 million copies worldwide, it was released in 1982 and falls in the genres of Pop, rock and R&B. Sold 43 million copies worldwide, it was released in 1975 and falls in the genres of Hard Rock, glam rock and heavy metal. Record label was Cleveland International and Epic Records. Sold 32.2 million copies worldwide, it was released in 1976 and falls in the genres of Country Rock. Sold 29.0 million copies worldwide, it was released in 1971 and falls in the genre of Hard Rock, Heavy Metal and Folk Rock. Sold 28 million copies worldwide it was released in 1986 and falls in the genre of Hard Rock and Glam Metal. Record label was Warner Bros.
Sold 26.1 million copies worldwide, it was released in 1980 and falls in the genres of Hard Rock. Sold 24.2 million copies worldwide, it was released in 1973 and falls in the genres of Art Rock, Progressive Pop and Progressive Rock. Produced by Bob Ezrin, David Gilmour, James Guthrie and Roger Walters. Sold 21.6 million copies worldwide, it was released in 1977 and falls in the genres of Disco.